Guildford had no barracks between 1818 and 1852. In 1848 the French indulged in another minor revolution, and Louis Napoleon, nephew of the great Napoleon, became President of the Republic. Fear of war caused a revival of interest in the army which had fallen to a very low ebb. The Militia was revived, the regular army was increased and more barracks were built. Among these was a new Militia Barracks at Guildford. The Militia, in various forms, dated back to Anglo-Saxon times when "every male between the ages of 16 and 60 was liable to appear armed when called upon to suppress internal disorders or to defend the country against invasion ". Controlled and regulated on a County basis under the Lieutenant of the County, it was officered by local gentry and landowners and their relatives. After going through a period of unpopularity and decline the Militia was reorganised in 1756 at the beginning of the Seven Years War. 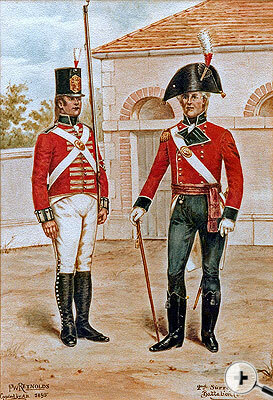 Under the reorganisation Surrey was to have two battalions, the first with headquarters at Richmond and the second with headquarters at Guildford. At some time during the Napoleonic Wars the Guildford Barracks ceased to be used for cavalry and became a Militia Depot, the whole thing probably being regularised in 1812 following the passage of a new Act of Parliament increasing the Militia. A sign of increasing prestige was the fact that the Second Surreys had become "Royal" in 1803 under Colonel George Holme Sumner. Of rather decorative appearance, the local Militia wore "scarlet coats faced with blue, and white leggings ". With the apparent final defeat of Napoleon in 1814 the Royal Surrey Militia went into what would now be known as "suspended animation" and were only called out for training four times between 1814 and 1852. But threats of another war with France had alarmed the Government who from 1848 onwards had increased the Army, revived the Militia organisation and planned more barracks at various locations including Guildford. 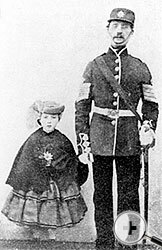 In 1852 the Second Royal Surrey Militia was revived under the new Colonel, the Earl of Lovelace. 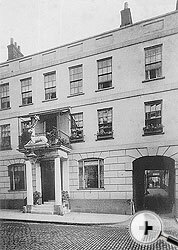 The Officers' Mess was again established at the White Hart Hotel and the local Superintendent of Police was asked to find billets for 20 officers and about 1,000 men - a somewhat daunting task as the population was only about 8,000. 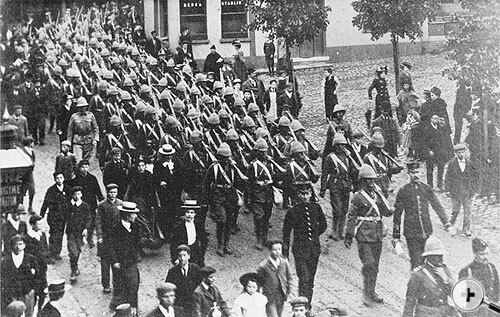 The difficulties of having staff scattered about the town was emphasised in November of the same year when two serious riots occurred and the outnumbered police called for military assistance which had to be hastily assembled. In 1853, consequent upon the Crimean War a large scale building programme of Army camps commenced in the Surrey and Hampshire areas. Initially Guildford was envisaged as the primary garrison town but due to opposition the choice finally fell on Aldershot. However, a new Militia Barracks was built at Guildford, close to the River Wey and bounding on to the old Friary Estate. The new buildings consisted of Adjutant's Quarters, Staff Quarters, Guard Room, Cells, Orderly Room, Store Room and Hospital grouped round three sides of the Parade Ground, the fourth side being bounded by the river where there was a powder magazine. The Parade Ground, Militia Depot, in the 1860s. The Adjutant's Quarters and the Guard Room were connected by an archway, leading to the Parade Ground, and round which was the Latin inscription "Salvam Domine Fae Vietoriam" 0 Lord Save Victoria. That the premises were to act as a fort as well as a barracks if need be, is shown by the fact that the windows formed port-holes, with additional portholes at the main gateway where there were two massive doors which were reinforced by a portcullis. Within the Wardrobe and Armoury were housed the clothing, equipment and arms for 1,000 men, "arranged in true military order by Companies". The colours and drums ornamented the walls. A Colonel, Lieutenant Colonel, Major, 10 Captains, 10 Lieutenants, 10 Ensigns, Captain and Adjutant, Surgeon, Assistant Surgeon, Sergeant-Major, 33 Sergeants, 33 Corporals, 10 Drummers and 990 Privates. 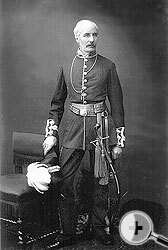 A prominent member of the staff from 1854 to 1862 was Sergeant John Walker Edgar. A native of Cork he had served in the Army since 1831 in the West Indies, America and Australia a truly worldly wise man of his times. 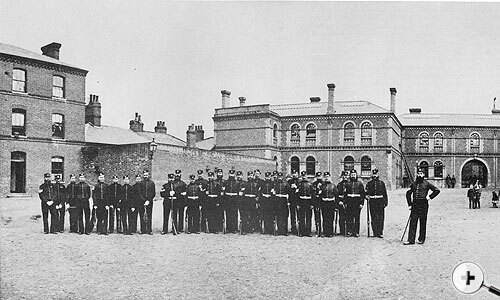 The Militia Depot, Guildford 1870. Although the buildings were up to date and handsome in their fortress style there was soon trouble with the sanitary arrangements and in 1854 there was an outbreak of cholera resulting in the deaths of two Sergeants and four children. As a preventive measure the rest of the staff and their families were moved out and put under canvas on the Hog's Back while the Barracks were thoroughly cleaned and purified. A Mr Turner, out for a saunter and "bounding merrily along" came on the encampment. At first he thought it was a gypsy gathering but seeing the British flag flying, and making further enquiry, he learnt the true purpose of the camp and doubtless departed hurriedly and less merrily. The Crimean War revealed the shocking neglect of Army health and a number of reforms, largely initiated by Florence Nightingale, resulted. As early as 1857 a Royal Commission was set up to examine the sanitary state of the Army and that was followed by commissions to enquire into conditions in barracks. Such a commission was set up in Surrey, the members consisting of Justices of the Peace for the County and others. A main item of concern at the Guildford Barracks was the main drain running under the Adjutant's and Sergeants' houses and down to the river causing "a smell in the Adjutant's dining room". At the same time the water in the three wells was analysed and found to be unfit for human consumption so tenders were invited from the Guildford Waterworks to lay on water at a cost not to exceed £20 a year. In 1866, after an outbreak of typhoid, another committee of fifteen, including the Earl of Lovelace and the Hon. W Brodrick was appointed to enquire into the unhealthy state of the Militia Barracks at Guildford. The Regimental Surgeon was satisfied as to health within the barracks and was of the opinion that the illness had been brought into the premises by a child who attended a school in Guildford where typhoid was prevalent. He reported that the Waterworks Company were now supplying water for household use. In 1870, the year of the resignation of Lord Lovelace, an extensive training programme was undertaken and the experiment was made of putting men under canvas n the Chalk Pit in York Road instead of in billets. The experiment was considered a success, the encamped troops attracting much favourable publicity which, among other things, resulted in increased recruiting. In the same year, Cardwell, Secretary of State for War, who lived at Eashing, introduced his Army reforms one of which was the provision of better barracks. 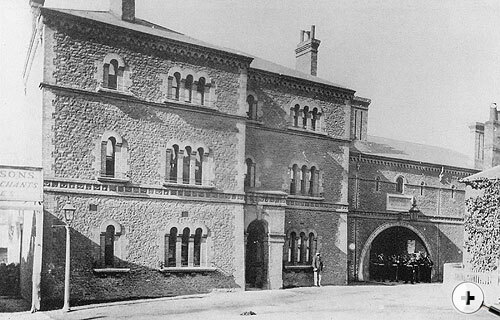 It was decided that the Guildford Barracks were too small and had no room for expansion so another site was looked for and eventually located at Stoughton where new barracks were erected in 1876. The old Barracks estate, like that of its predecessor, was procured by a brewer, Mr Trimmer of Farnham, and eventually made subject of development. History in the centre of the town had repeated itself and the residents now had to look to Stoughton for military activity and were to do so for many years to come. A new housing estate, attractively embodying parts of the old Stoughton Barracks, now stands there.